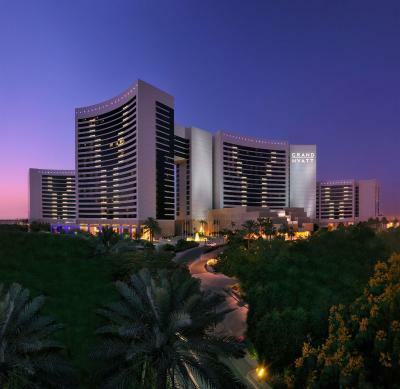 Lock in a great price for Grand Hyatt Dubai – rated 9 by recent guests! Spacious rooms. Unlike some more expensive hotels at the palm, this one offers lot of privacy and quiet. The pool is gorgeous and was never crowded during my stay. Service is excellent. Bed very comfy. Everything was really perfect. every service was professionally performed, very clean and comfy. Excellent staff from reception to room service to house keeping, the facility very beautiful ، thanks to all . Booked a family room via Booking.com which fits “ 4 adults + 2 children. When check in the receptionist told me your reservation covers 4 adults only as per booking.com notification. I argued the hotel, and the hotel has kindly revised it to be for 6 people and gave me two free extra beds and dinner for all my family. 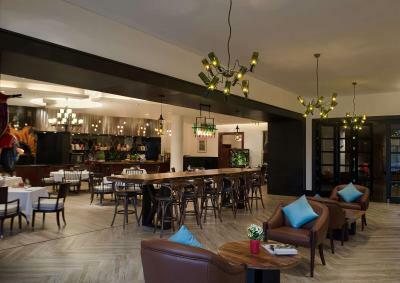 I then talked to booking for this silly mistake, they apologized and offered me to talk to the hotel, o told them i already sorted it out with this fantastic hotel. I love how comfy was the bed. I didn’t expect that there is no milk or rainbow in the mini bar for coffee..
Hosam at the reception was very kind and attentive. He made sure our waiting at the front desk is not long (checking in and out). He was helpful. As the front of the property he deserved the 5 star service of excellence. The "club/lounge" package was worth it, it saved us dinner at The Market and unlimited drinks at Panini cafe. Animals (ducks and ducklings, rabbit & peacocks) was a plus at this hotel. 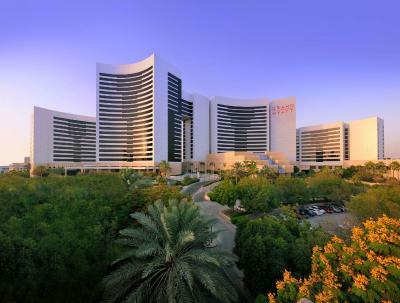 Grand Hyatt Dubai This rating is a reflection of how the property compares to the industry standard when it comes to price, facilities and services available. It's based on a self-evaluation by the property. Use this rating to help choose your stay! 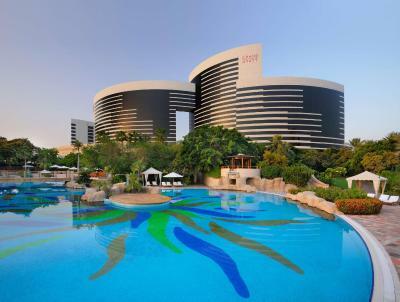 Located near bustling Sheikh Zayed Road, Grand Hyatt Dubai is set on landscaped gardens with outdoor and indoor pools and features 13 dining and entertainment venues. 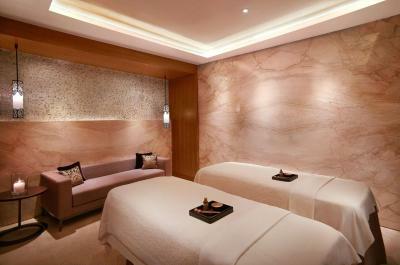 Spa treatments and facilities are also featured. 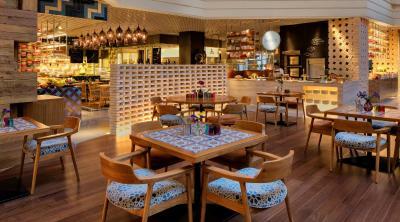 All accommodations at the Grand Hyatt Dubai is decorated with traditional Arabic touches. It features a flat-screen TV, free WiFi and a mini-bar. 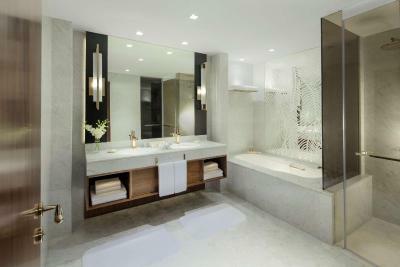 The luxury marble bathroom includes spa tub, bathrobes and exclusive toiletries. 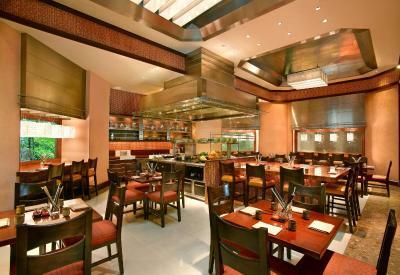 Guests can choose from Indian, Japanese and Singaporean food among the Grand Hyatt’s restaurants. 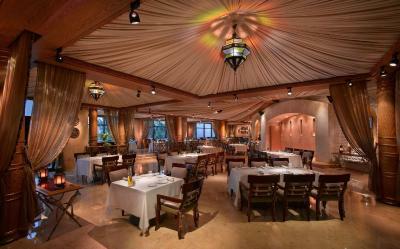 Guests can dine on one of the terraces overlooking the resort grounds. 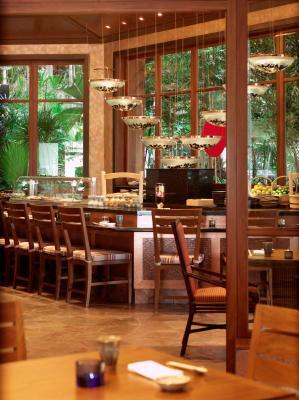 The open kitchens allow diners to see the chefs in action. Enjoy sunbathing in the extensive pool area, make use of the indoor pool, or work out in the state-of-the-art fitness center. 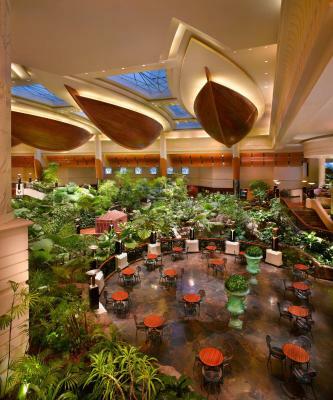 The Grand Hyatt has an atrium, featuring a tropical indoor garden with streams and bridges. 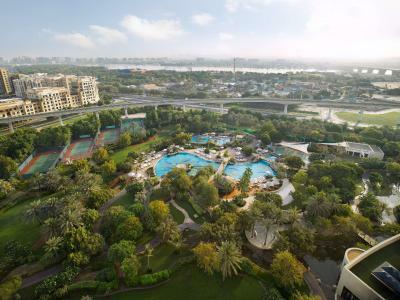 Dubai Creek Golf & Yachtclub is less than 1.2 mi from the property. Burj Khalifa and Dubai Mall are 15 minutes' drive away. 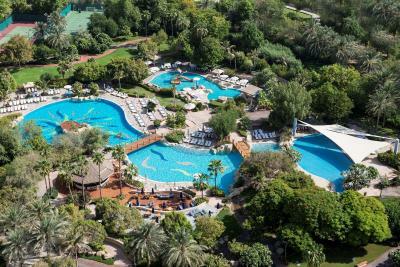 The resort is only a 15-minute walk from Wafi Shopping Mall. A free shuttle bus service is available. 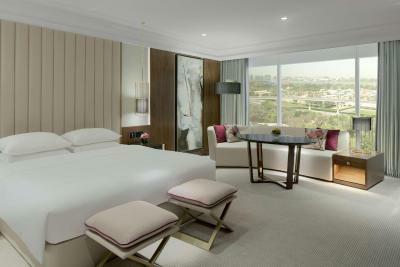 When would you like to stay at Grand Hyatt Dubai? 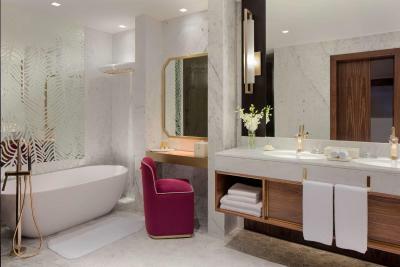 These rooms include a flat-screen TV, an Italian marble bathroom and a spacious work area. 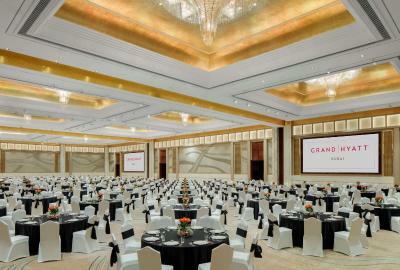 This room includes 2 Grand Rooms connected with each other, this room is ideal from families. 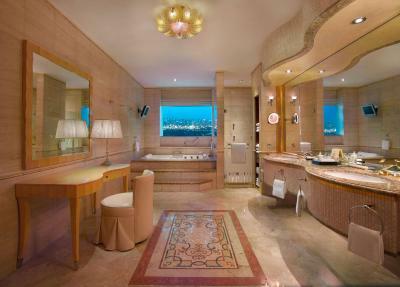 This suite offers Arabian touches and views of Dubai's skyline. It offers a flat-screen TV, a mini-bar and a spacious work area. It includes Grand Club privileges with access to a private lounge serving Continental breakfast, evening cocktails and hors d'oeuvres. 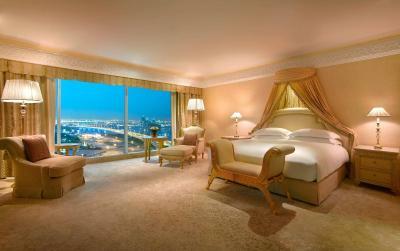 This room offers Arabian touches and views of Dubai's skyline. It offers a flat-screen TV, a mini-bar and a spacious work area. 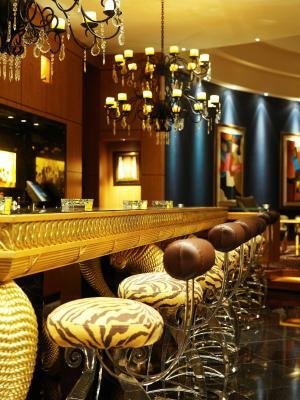 It includes Grand Club privileges (including access to lounge for breakfast and cocktails). This room offers Arabian touches and views of the Creek. It offers a flat-screen TV, a mini-bar and a spacious work area. It includes Grand Club privileges (including access to lounge for breakfast and cocktails). Featuring Arabian touches and views of Dubai's skyline, this room offers a flat-screen TV, a mini-bar and a spacious work area. 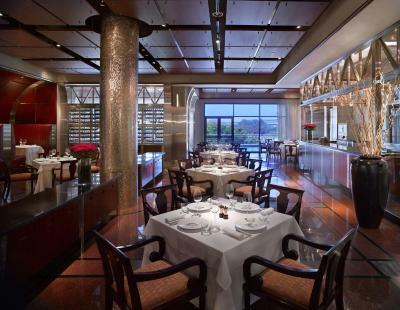 It includes Grand Club privileges (including access to lounge for breakfast and cocktails). 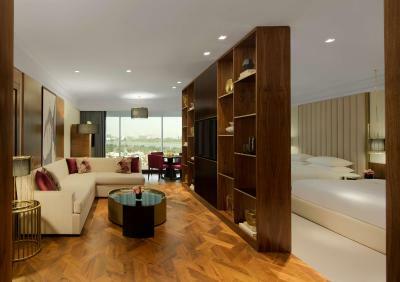 Featuring views of Dubai Creek or the city's skyline, this luxurious suite comes with a living area with a flat-screen TV, a mini-bar, kitchenette and a spacious work area. It includes executive lounge privileges with access to a private lounge serving Continental breakfast, evening cocktails and hors d'oeuvres from 06:30hours to 11:00 hours. 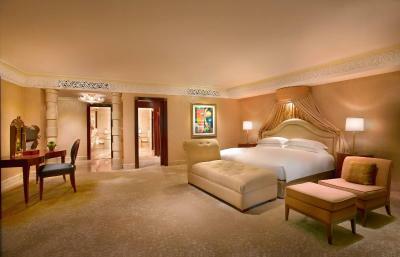 This room offers a flat-screen TV, an Italian marble bathroom and a spacious work area. 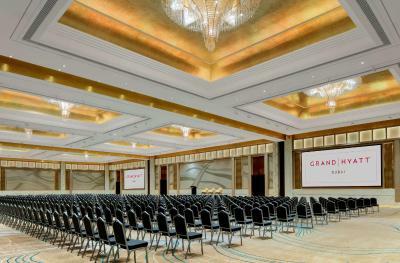 Please note connecting Grand rooms are subject to availability. This room type can only accommodate 2 adults and 1 child aged 2 maximum (in baby crib). 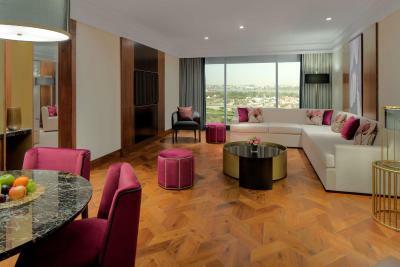 Featuring views of Dubai Creek, this suite comes with a flat-screen TV, a mini-bar, kitchenette and a spacious work area. 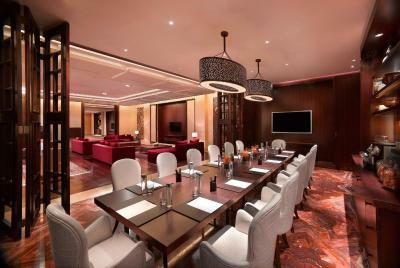 It includes executive lounge privileges with access to a private lounge serving Continental breakfast, evening cocktails and hors d'oeuvres from 06:30 hours to 11:00 hours. 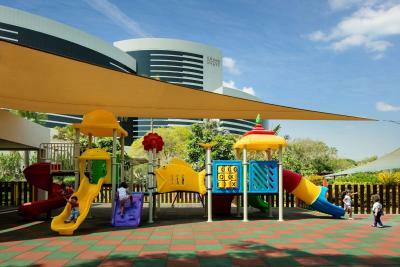 It can accommodate up to 7 adults. An extra bed will be added free of charge. This twin room has a tumble dryer, bathrobe and mini-bar. This twin room features a flat-screen TV, mini-bar and tea/coffee maker. 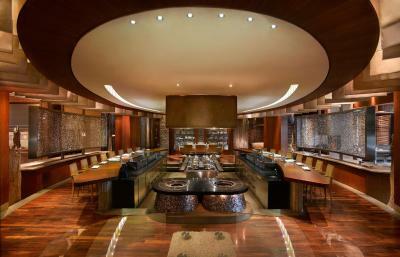 House Rules Grand Hyatt Dubai takes special requests – add in the next step! 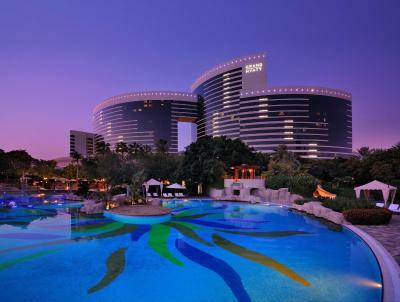 Grand Hyatt Dubai accepts these cards and reserves the right to temporarily hold an amount prior to arrival. Please note that the same credit card used to make the booking must be presented upon check-in. A free shuttle bus service is available to Kite Beach which departs from the hotel daily at 10:00 AM. 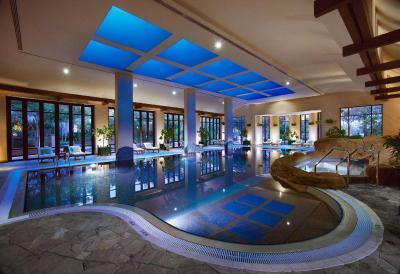 This hotel is absolutely amazing. Everyone was really kind, and helpful. All of our questions have been answered right away. The room was spacious, the bed was really comfortable. The breakfast, and dinner was 10/10! I would love to come back to this hotel again in the future and highly recommend to everybody. There was a confusion about the final price we had to pay since at checking in we were made to understand that we paid the full amount , which was not the fact. Trainee hiccups! I did not have breakfast in the hotel. Pathways are not completely easy accessible with baby trolleys. First stairs there might be also ramp to go to pool area from lobby, but next stairs dont have and trolleys need to Be carried over stairs. 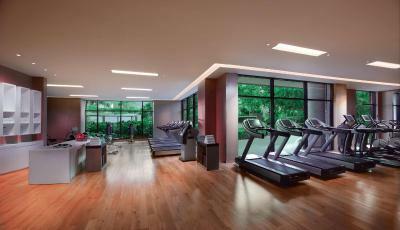 Facilities was very nice, restaurants are surrounding indoor park including fountains and pool area is large. Nice hotel to stay with baby. Breakfast coffee was very bad. Water with a coffee taste. Not enough waiters in the big breakfast room. Lack of sunbeds at the pool area. Big modern rooms, nice lobby, close to the airport and old town. Cleaning staff does not start too early, so you can have a good sleep. Staff are properly trained to deliver service unlike other Dubai hotels regardless of cost. The SPA receptionists are not good in attitude as the other hotel staff. Breakfast was excellent. Location is handy to the airport for a short stopover. The hotel exceeded all my expectations with respect to facilities, location, cleaninless and most importantly the staff, who totally impressed me both by their number and availability as by the quality of their services. 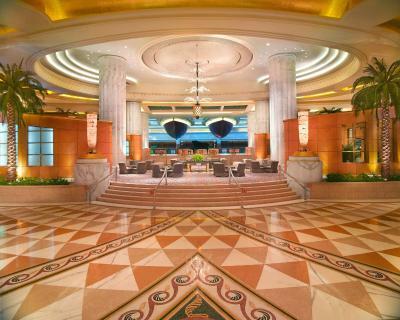 I really believe that the hotel largely contributed to an great vacation in Dubai.